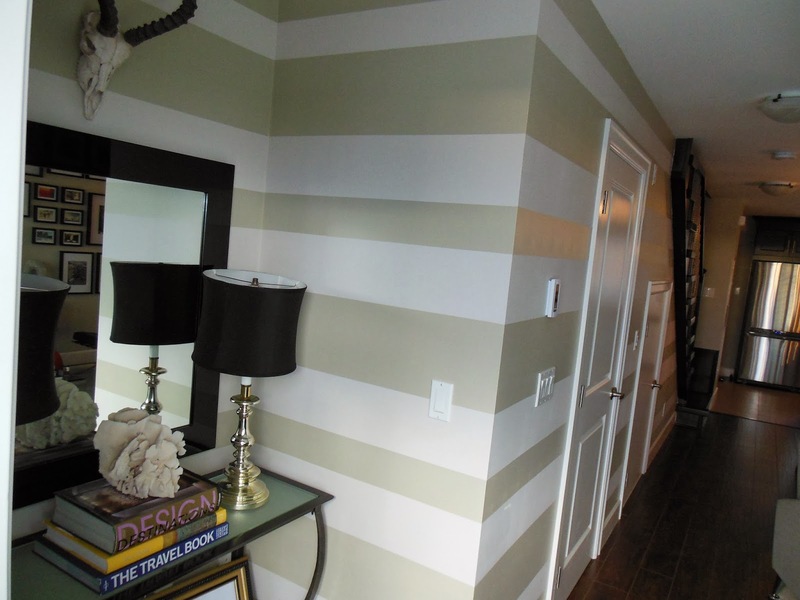 What do you think of a striped feature wall in your living area? 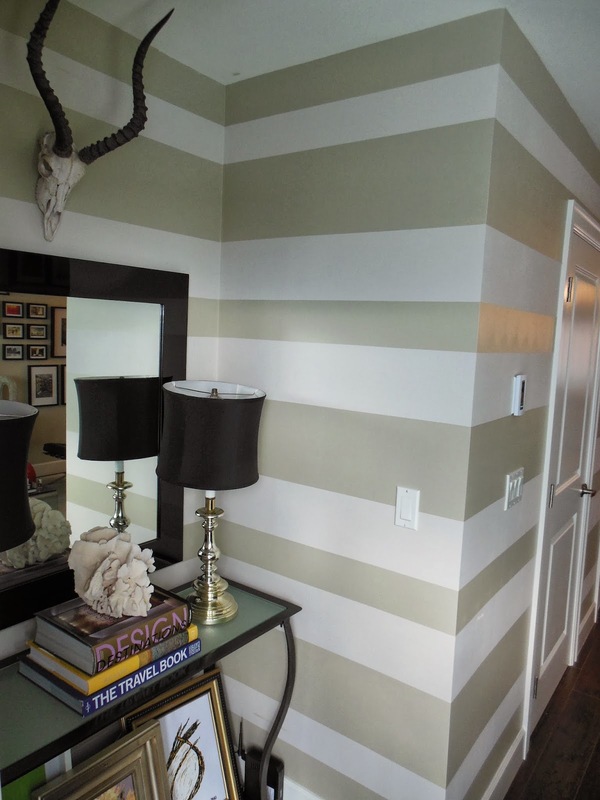 Personally, I have always been a fan and so a while back, my husband and I finally got around to doing a striped wall on our main living floor. We find it so amusing how developers will install doors in the most random places. In our case, the developer had installed a powder room which of course required a door, but then, the hot water tank was installed under our stairs; beside the powder bathroom, the problem with this was that now we had 2 doors in a wall that was approximately 8.5 feet high by 10 feet wide. Not a ton of space and quite frankly, a major eyesore for the most part. 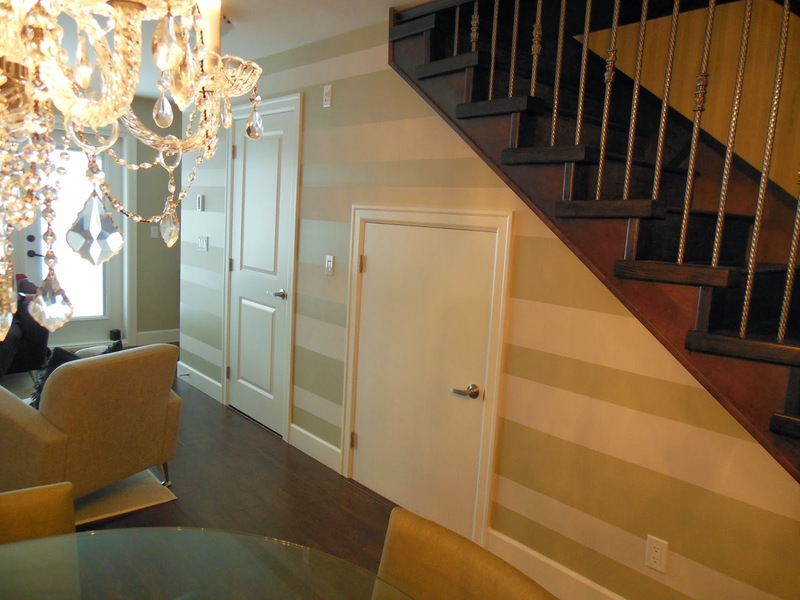 So, we decided to do the feature wall on that exact side as we figured if we drew the attention to the stripes, the doors would not necessarily be the first thing people would notice or comment on. We are happy to announce that our plan worked. Whenever our friends and family come over, they comment on the striped wall and I really can't remember the last time the subject of the random doors ever being discussed. 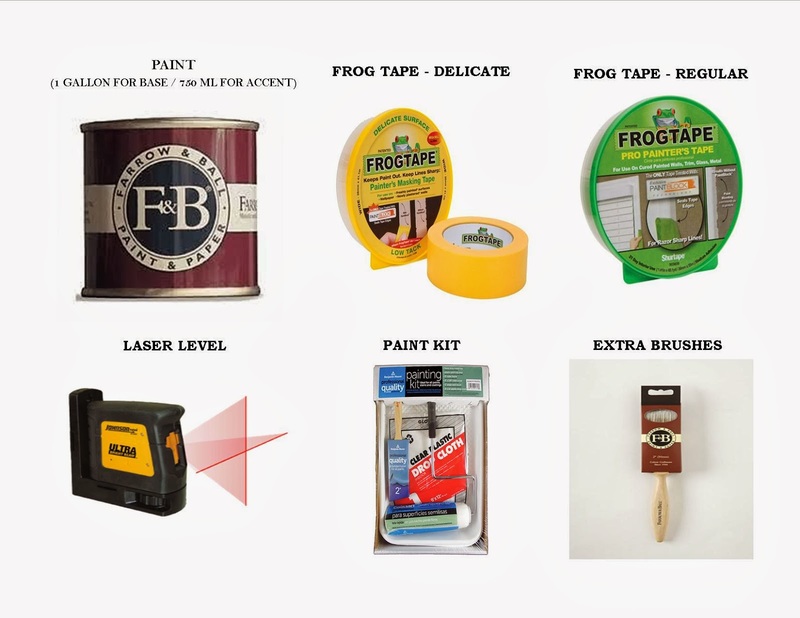 Frogtape was our lifesaver for this project. 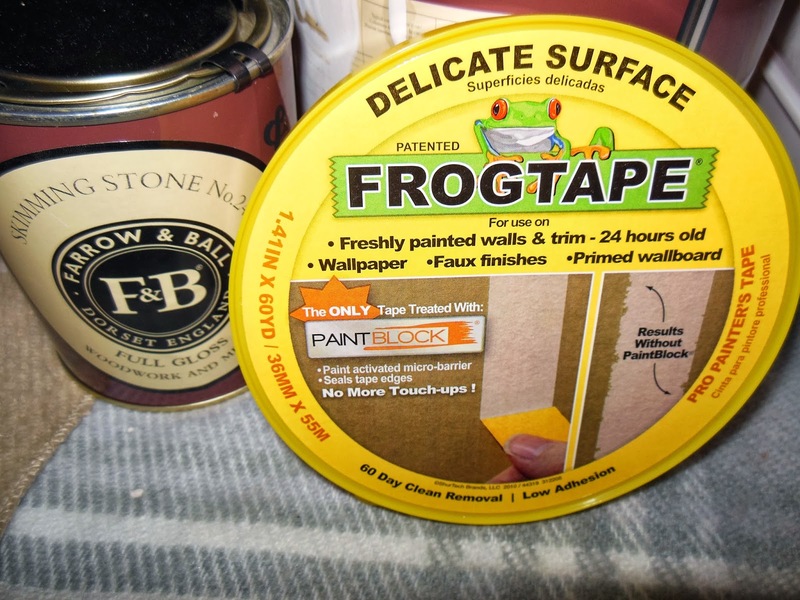 We used both the regular frogtape and the delicate surface frogtape shown above but we really didn't notice any difference in the sharpness of lines with the "delicate surface" frogtape. Neither our local Home Depot nor Rona carried the "delicate surface" tape so when we ran out we just decided to take the risk and use the extra roll of regular frogtape that was sitting around and thankfully it turned out fantastic. The paint we used was Farrow & Ball in Skimming Stone which is my favorite paint brand. One of the only places that carries Farrow & Ball in the lower mainland of Vancouver is Kerrisdale Lumber and I highly recommend Kerrisdale Lumber for their amazing sales people and quality of service. They are hands-down the best hardware store in Vancouver. Plus, you can pick up sample pots of Farrow & Ball in every color that is in stock for $7 which is perfect if you are trying to figure out the color or like us, to complete the project with touch-ups at the end. Our stripes look like 2 different colors but it is all Skimming Stone, the trick to this is to use a flat beside a high-gloss, the base is flat emulsion (2% shine) and the stripes are the highest gloss available in the color (it's technically for baseboards and doors but we used it for the wall and it turned out just fine). The ratio we used was a 10 inch stripe sandwiched between 7.5 inch base stripes and then 5 inch stripes sandwiched between 7.5 inch base stripes to give it more depth and interest. The combination of different width of stripes and the flat/high gloss paint in the same color really gives our living area more depth and warmth to our home now. We started our stripes in the centre of the wall so in case of any discrepancies in measurements or as we quickly found out, not perfectly straight walls and ceilings in our home, the lines at the top and bottom of the wall (where it's the least visible) would take the hit for any small mis-measurements. 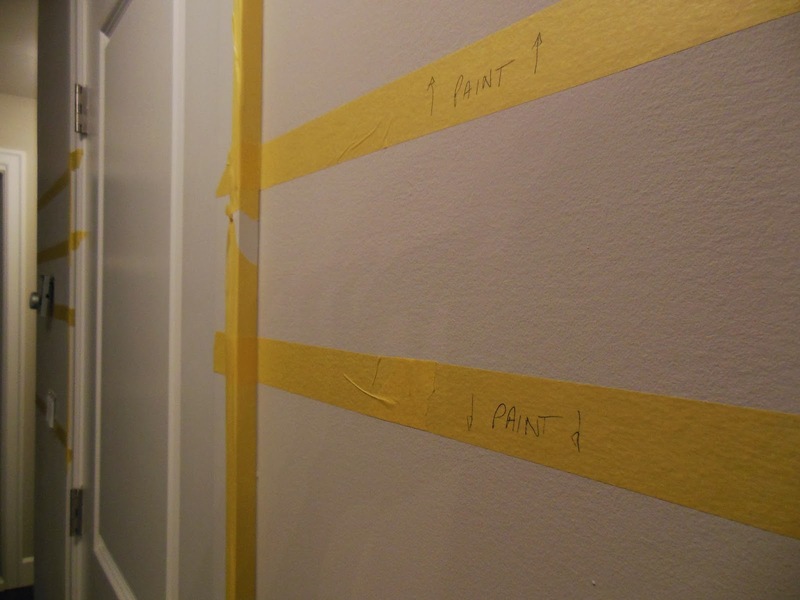 We marked off which sides of the tape to paint. 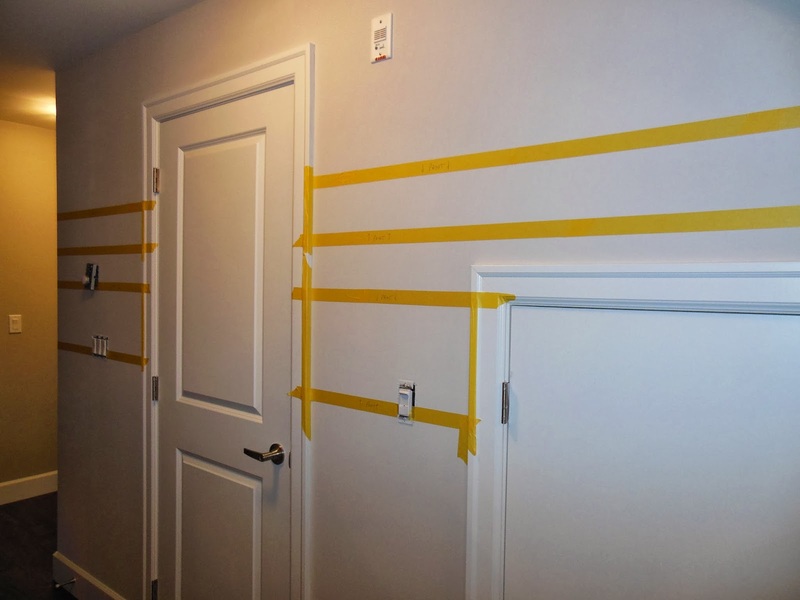 Trust me, when all the tape is up, it is extremely confusing so marking it off as you tape is a great solution. And then we painted, painted and painted some more. After some sweat and random unintelligent words being thrown around, our project was finally complete. Despite some hostility and frustration, this DIY was completely worth it. Even though this project might bring out some negative energy in your house, temporarily, it is so fulfilling and worth it in the long run that I hope you can try it someday soon.